When you activate this dialog box, it defaults to settings suitable for fixing images that have been backlit, with the shadows much too dark. The Shadow slider starts at 50 percent and the Highlight slider at 0 percent. If you select the Show More Options check box, you see the full dialog box. Amount: The degree of change that you want to apply. A higher number equals a more drastic application of the tonal change. Tonal Width: This represents the number of tones, from the 256 different tonal levels in the image, that are affected. For example, if you set Tonal Width to 25 percent, one quarter of the 256 tones (64 tones) are modified. A value of 50 percent affects 128 tones and produces a more pronounced change. You can best decide what value to use by watching your image while you move the slider. Use a small value to brighten only the very darkest shadow areas or to darken only the lightest highlight areas. Increase the value to brighten more of the dark areas or darken more of the highlights. Don’t use very large values, or you end up with glowing haloes at the boundaries between the shadows and highlights. 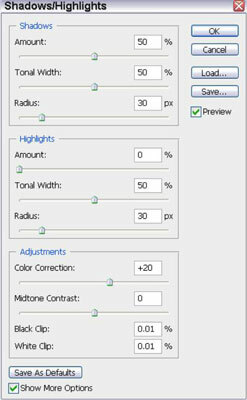 Radius: The Radius slider helps Photoshop determine what qualifies as a highlight pixel and a shadow pixel. Ordinarily, the control examines each pixel’s neighbor to make this determination. Increasing the Radius value enlarges the size of the neighborhood so that more pixels are counted as highlight or shadow pixels, rather than middle-tone pixels (which are not affected by the Shadow/Highlight control). Monitor your preview image to see whether you’re getting the effect you want. Color Correction: This slider isn’t a color-correction tool as much as it’s a way of compensating for color shifts that occur when you’re fiddling with the tonal controls. Use it to remove these casts. Midtone Contrast: Although the shadow and highlight controls adjust only the darkest and lightest areas, this slider lets you apply some fine-tuning to the middle tones. Black and White Clipping: Use these controls to increase contrast intentionally by dropping (or clipping) a desired percentage of black or white tones from your image.